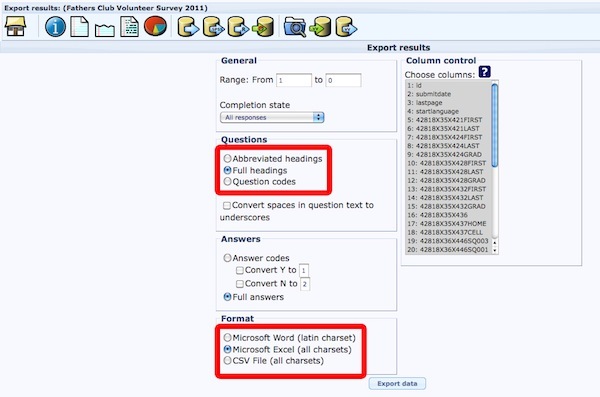 Having created a survey within LimeSurvey and provided participants with ample time to respond, you can choose to either view their responses online, or more likely, export their responses in to an application such as Microsoft Excel. This allows for easier manipulation of the data in order to better understand and present your results. The button just to the right, showing half a piece of torn paper, is to display only the last 50 responses. This can be useful if you have a large number of responses and only wish to see the most recently completely surveys. A dialog box will now be shown within your browser prompting you to download the file based on the format you choose to export. Once downloaded, this file can then be opened with its default application, such as Microsoft Excel.